Reenactment performers and history fanatics have decided to conduct a great experiment in Moscow Region: A 24-year-old man is going to stop using all modern technology and spend six months as if he was living in the Middle Ages, without Internet, electricity, or modern clothing. The goal is to see how medieval instruments work and how the mental state of the volunteer may change over the course of the experiment. A day before the start of the experiment, Pavel Sapozhnikov sets aside all the modern things that he will not be able to use for the next six months. An iPad, an iPhone, scotch tape — all these things will have to wait to be used. Instead, Pavel takes different essentials of the ninth century: a flint, a steel to strike sparks from flint, a fibula, a rake-comb to get rid of lice. In addition, he has grindstones, an ancient flick-knife, some wax to wax thread (it goes through skin easier this way), and, last but not least, "the most important instrument — an axe." "With an axe, you can make anything you need. But when you can't make something you need, you can make an instrument, with which everything is possible," says Pavel. “Many objects haven't had their form changed for ages,” Paul says while admiring his axe. “Our ancestors came up with the ideal form.” Pavel tucks all of his "gadgets" (except, of course, his axe) underneath his leather belt, which he wraps around himself. Pockets were not used in the ninth century. Time to light a fire. Pavel takes his flint and steel, puts some tinder underneath — a piece of burned cloth that is supposed to catch fire from just one spark. For a long time Pavel tries to strike sparks from his flint, but the tinder just will not light up. Quietly, he lights it with a lighter — last day to cheat! By tomorrow, he won't have a lighter anymore. 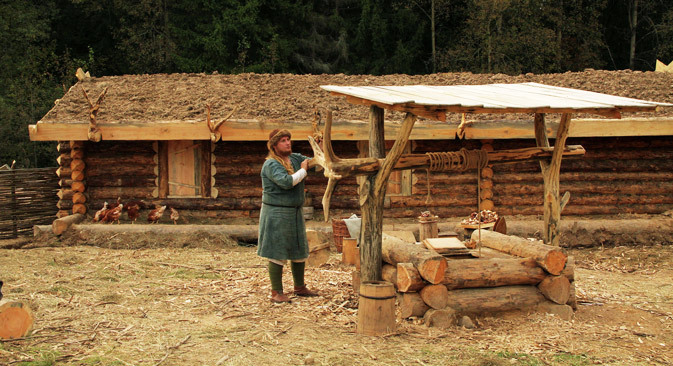 The recreated medieval dwelling is situated just 28 miles away from Moscow, near the loud Yaroslavsky Highway. There are goats and chicken running in the yard and a red-bearded giant in an old Russian-style shirt and leather boots trying to light a fire. This is Pavel Sapozhnikov, the central figure of the experiment. For an entire six months he will live alone in a recreated (thanks to archaeological finds) ninth century Novgorod khutor, or settlement. He will eat according to ninth century traditions and will spend the upcoming winter without central heating. In the center of the settlement there is a house consisting of three premises. In the middle, there is a living room with a small heater. Instead of a bed, which we are all used to, there is a bench with animal skin on it. Hanging on the ceiling are dried fish and mushrooms; in one corner, there are tubs with cranberries and pig fat. There is a strong fish stench in the room, but, according to organizers, it should be kept at room temperature. Besides all that, there is a warehouse stuffed with different kinds of grains — but only the ones that were known in the ninth century. So you won't find corn here: Columbus discovered the crop at the same time as he discovered America, approximately 500 years after the ninth century. The last room in the house is a barn for the chicken and goats. Organizers brought Sapozhnikov food for the first few days. He is also allowed to hunt rabbits and fox from the nearby woods. He must, of course, use old methods — for example, with the help of snares. "It is very interesting for us to see how a person could live through inter-season, through fall and winter, when there are less food and provisions, when there are less daylight hours," the project's initiator, Alexei Ovcharenko, says. The experiment should last until Mar. 22 — till the equinox — the start of the new year according to the Slavic calendar. As for Paul, he isn't afraid of the cold. Actually, he is afraid of information deprivation due to lack of books, newspapers and Internet. Pavel is being closely watched, but so are the leather shoes that he is wearing. To see how long they will last — this is one of the experiment's goals. The project's coordinators think of it as experimental archaeology. "How often you have to patch wool socks, how long the skis and knives will last, is the ceiling covered with animal skin solid — we want to test many everyday household things," organizers say. Everyday settlement life is also being analyzed. When the goats were brought to the khutor, they produced around 50 ounces of milk a day. Now, when they are no longer being given mixed feed and are not being pumped with antibiotics, they do not even give half the amount they used to! "We want to check how the amount of goat milk and the size of eggs will change. Will goats and chicken become smaller in the next few years? How will free pasturage and absence of food chemicals affect them?" Ovcharenko says. There is another important aspect to this experiment — a socio-psychological one. The organizers of this project want to see how life in solitude will affect a person. "We sent Pavel to the past alone, completely on purpose. The immersion into the past and the estrangement from modern time will be more efficient,” says Ovcharenko. “If he was with a companion, they would be able to discuss the modern world." Pavel does not have higher education. He spent four years in university studying emergency medicine, but then dropped out and decided to take up historical recreation, which became his profession. His loved ones approve of him. His bride, Irina, helps him settle down in his khutor. She says that she herself was ready to plunge into medieval times, but organizers thought differently. "A man must choose his path by himself. It is safer here than in Moscow, and I disagree with you that he will throw away half a year of his life. In the end, he will always be able to still get a proper education and make a career," says Pavel's mother, who is also named Irina. The fact that her son, being in the prime of his life, is destined for voluntary solitude does not scare her. The experiment is rather tough, but Pavel's health will be looked after. From a special wicker fence he will be watched by a writer with whom he will not be allowed to communicate. In addition, each month there will be “visiting days” at the khutor: A doctor and a psychologist will come to check up on Pavel, and, of course, his relatives will visit. Between visits, relatives will be able to learn about Pavel's life in isolation through his blog and the observing writer's messages. A movie about this experiment will be made, and Pavel will have the leading role. At the moment, according to organizers, the projects budget is around 2 million rubles ($62,840).